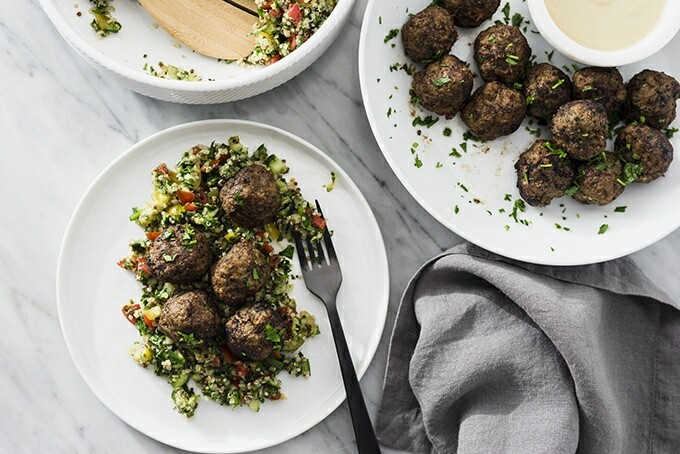 These Lebanese beef kofta spiced meatballs are a modernized version of the classic. Made with a flavorful spice mixture and fresh herbs, they are an addictive snack or a satisfying meal served with tabouleh or rice. Naturally paleo and Whole 30 compliant! Cam and I have a deep, deep affection for Lebanese cuisine. We had a few favorite spots in Arlington that we visited with frequency, but since moving to Frederick, MD in July, we haven’t yet had the chance to dive into the local food scene very much (although we did find a fantastic local brewpub and have been there twice). 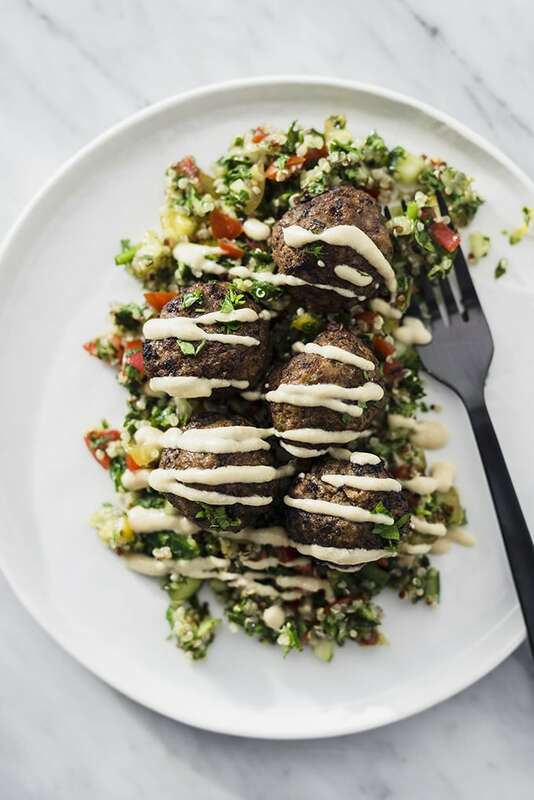 I’ve been having a serious craving for beef kofta, and this slightly modernized take on the classic really hit the spot. 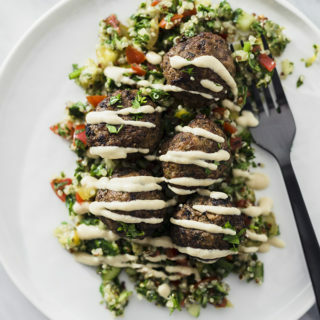 Juicy spiced meatballs smothered with tangy tahini sauce? YES. Beef kofta was the dish that made me fall head over heels in love with Lebanese cuisine. While firmly in the savory category, there is a sweetness that subtly cuts through the spice and it makes this very simple dish incredibly addictive. I think that’s what I love most about Middle Eastern cuisine in general – the simplicity. Lots of whole, real foods. Little fuss. Incredible flavor. The traditional lebanese kofta base is ground meat (lamb, beef, sometimes chicken), with parsley, onion, cumin, allspice, and salt and pepper. I add a dash of cinnamon to my beef kofta, reminiscent of my grandmother’s Sunday sauce recipe, as well as a bit of mint and some coriander, paprika, ginger, and garlic powder. For this meatball version, I also added an egg yolk to help them keep their shape. Beef kofta is typically skewered and grilled, but I was feeling a little, oh, salty – so I made meatballs instead. I’m a rebel, I tell ya. The meatballs are seared, then baked. I do the whole process in my trusty Lodge 10″ cast iron skillet (affiliate link), start to finish. First, I brown the meatballs in a bit of avocado oil in two batches. Then I transfer all of the meatballs back to the cast iron in a single layer, cooking oil and juices and all, and bake them for 15-20 minutes, or until the internal temperature reaches 170*. Total baking time will depend on their size. This takes a bit longer than grilling, but they stay a lot juicier this way. Feel free to skewer these up and toss ’em on the grill. To do so, thread 3-4 meatballs onto a skewer, and pinch them together so they turn into more of a log shape. Grill over high heat, rotating every minute or so, until the internal temperature reaches 170* – about 5 minutes. PS – this is a terrific way to cook kofta for a crowd. The skewers can be made well in advance and tucked into the fridge for several hours. Once you’re ready to serve, just slap ’em on a hot grill. I finish off this dish with my go-to tahini sauce and serve it over quinoa tabouleh (click for the recipe on my IG page!). 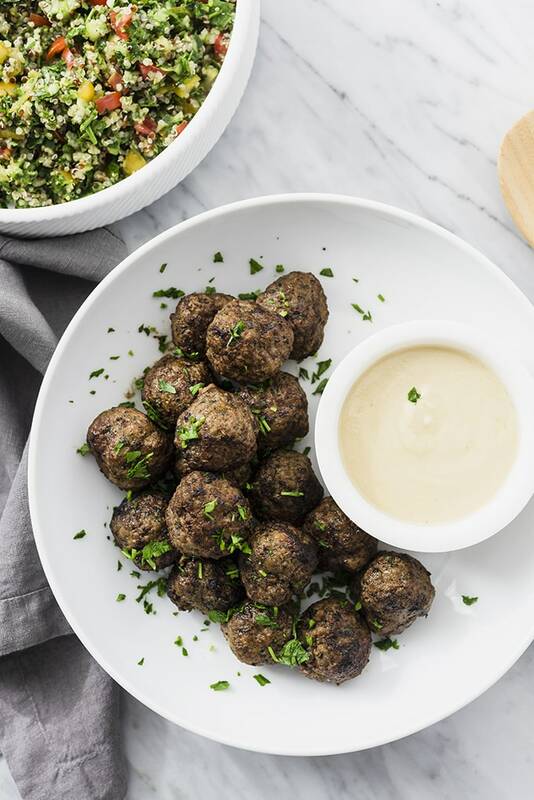 Leftover meatballs are an awesome midday snack, served cold and dipped in tahini sauce. You can also serve over cauliflower rice with a simple cucumber and tomato salad for a completely paleo and/or whole 30 compliant meal. 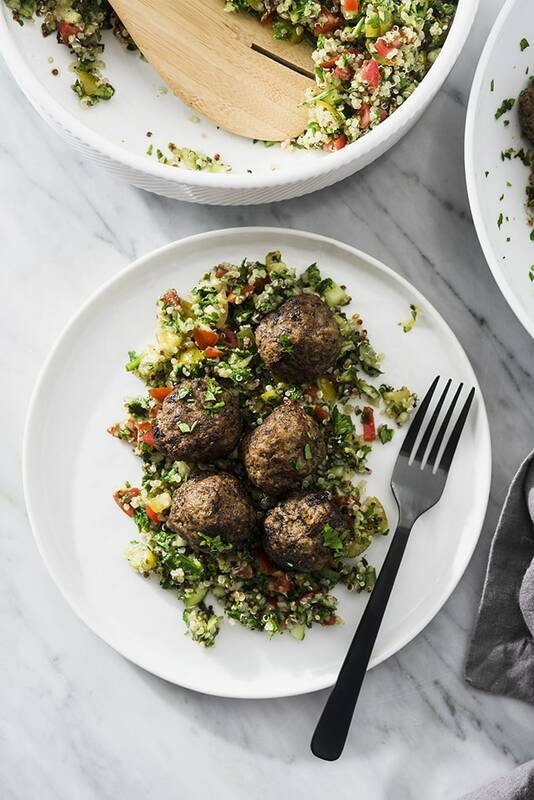 These Lebanese beef kofta spiced meatballs are a modernized version of the classic. Made with a flavorful spice mixture and fresh herbs, they are an addictive snack or a satisfying meal served with tabouleh or rice. Add the chopped onions, mint, and parsley to the well of a food processor. Pulse 8-10 times until the herbs and onions are minced. Add the spices to the onion and herb mixture and pulse a few times to incorporate the spices. Break up the ground beef into chunks and it to the spiced onion and herb mixture, then add the egg yolk. Pulse the mixture until the ingredients are completely incorporated into the ground beef. Form meatballs that are 1.5" in size (mine were about 1 heaping tablespoon each, for a total of 18) and set aside. Heat a cast iron pan over medium heat. Add the avocado oil and heat until it shimmers. Add half the meatballs to the cast iron pan and brown, giving the pan a gentle toss every minute or two, until the meatballs are browned on all sides. Remove the brown meatballs and set aside. Repeat with the remaining batch. Once all the meatballs have been browned, return all the meatballs to the cast iron pan in a single layer, leaving a little space in-between each. Bake at 350* for 15-20 minutes, or until the internal temperature reaches 170*. 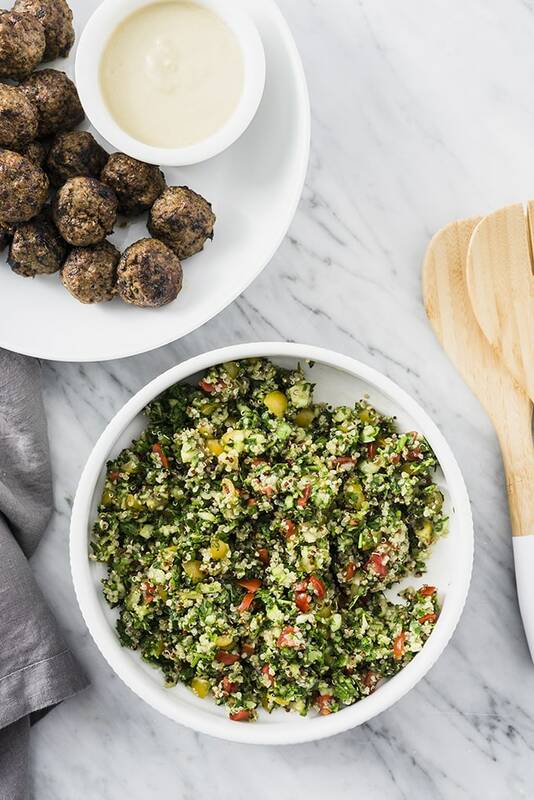 While the meatballs are baking, prepare the tahini sauce. Place the tahini, olive oil, lemon juice, salt and pepper into a blender along with ¼ cup of water to start. Blend until emulsified. Add additional water to reach desired consistency. For dipping sauce, vs. a salad dressing, I use closer to half a quarter cup. 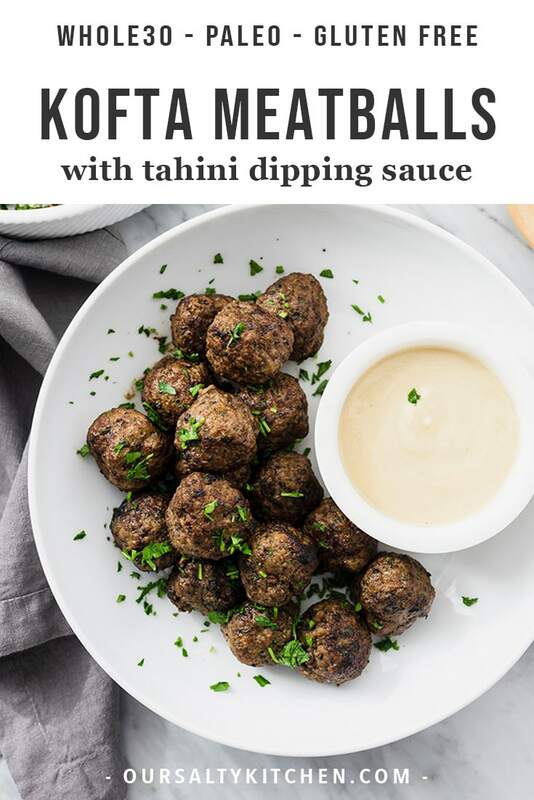 Remove the meatballs from the oven and serve immediately with tahini sauce on the size. Great dish. Made it once so far. Love my spices so going to double the herbs and spices next time but importantly cook it for 10 min as 20 and they were dry.